On Feb. 25 of this year, the L.A. Times reported that full-sized trees had been cut down on the rights-of-way of two freeways, apparently to improve visibility for large supergraphic signs on nearby buildings. 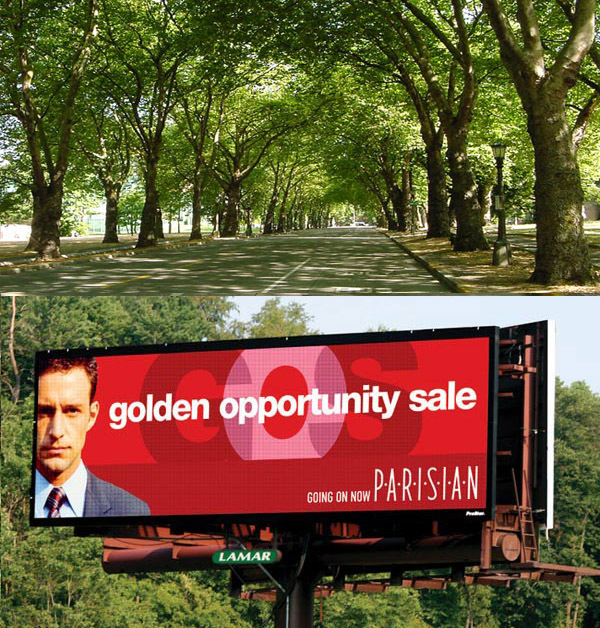 See Outraged By the Cutting of Trees on Public Property to Enhance Billboard Visibility? The Coalition to Ban Billboard Blight sent inquiries to Caltrans, the California Attorney General’s Office, the Governor’s office, and the State Senator and Assemblyperson representing the districts in which the act occurred, Jenny Oropeza, and Karen Bass, respectively, asking that an investigation be undertaken. Not a single response of any kind was received. Contrast that with Connecticut, where Lamar Advertising (which is currently trying to push a “billboard reduction” plan on L.A.) allegedly cut trees on public property that were impeding the view of their billboards. The act was promptly investigated, and the state’s Attorney General filed suit against Lamar. Read Attorney General’s Press Release. Are trees more valuable in Connecticut? Or do public officials there—unlike our own, apparently–actually care about the vital public resource that is our visual landscape?